One of the most invigorating aspects of working with our clients is taking the time to learn more about them and their ultimate vision for their home. It was a few years ago when Mary and her James first invited us to their Dayton, MN home. Like many homeowners, they had a wish list with several items on it, but felt most comfortable completing the project in phases. Over the years, we’d completed window replacements and installed new gutters. Being pleased with the work our team had completed, they decided it was time to take a hard look at the interior of their 1970’s home. While there were many features they loved, there were several they wanted to change in her kitchen and bathroom. Most notably, were upgrades to give the home a more modern feel. High on the couple’s list was better lighting, opening up the space between the kitchen and dining room, and the creation of a more contemporary atmosphere. Kitchen Challenges: Working on the kitchen excited us because there was so much potential to address the areas of concern. One of Mary’s biggest frustrations was how isolated the room felt from the rest of the home. 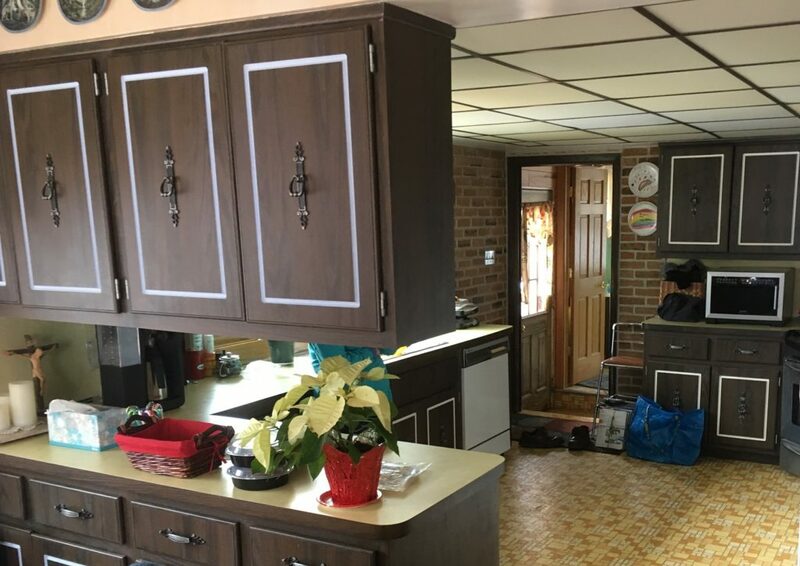 Her hope was that we could find a better cabinet configuration that would allow her kitchen to better flow into the dining room. 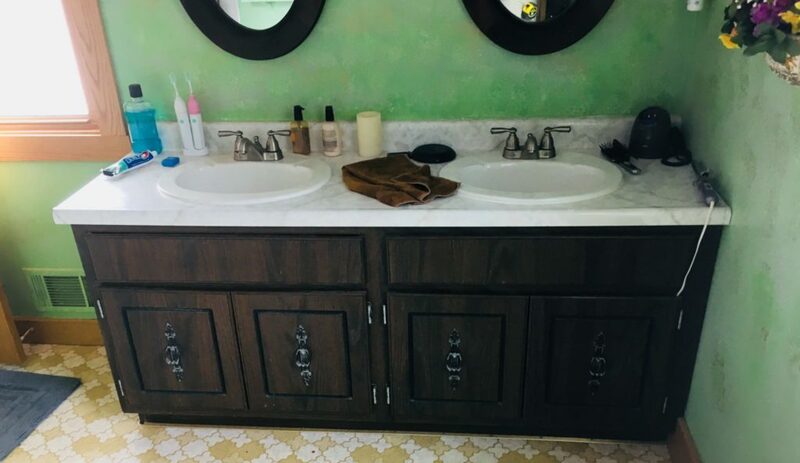 The cabinets were a dark wood and the hardware was centered, rather than corner aligned. The flooring and counters were worn and outdated. Ceiling panels and partial brick walls made the room feel dark and closed in. Kitchen Solutions: One of the biggest reasons that the kitchen felt cramped was because the cabinetry configuration boxed the space in. 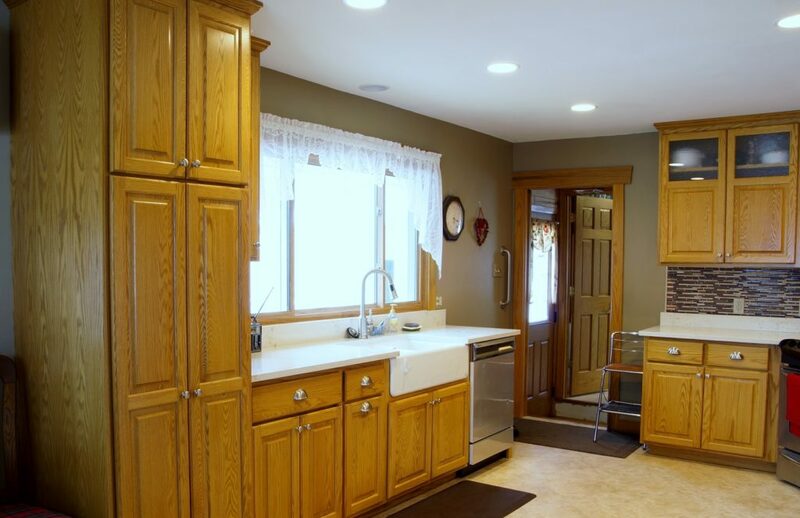 We addressed this concern by adjusting the cabinet configuration to the room’s outer walls. Doing so eliminated the peninsula blocking off of the dining room. The oak cabinets the couple opted for were a dramatic change from the dark wood ones they replaced. In place of the tired laminate countertops, we installed quartz. In terms of lighting, the room’s previous false ceiling was creating a darker, more closed in space than necessary. To alleviate this issue, we removed it and added an abundance of recessed lighting. Light brown paint and a brown tile glass backsplash added a modern touch to the room. The utilization of a Kohler undermount sink with coordinating faucet added a contemporary feel to the room. 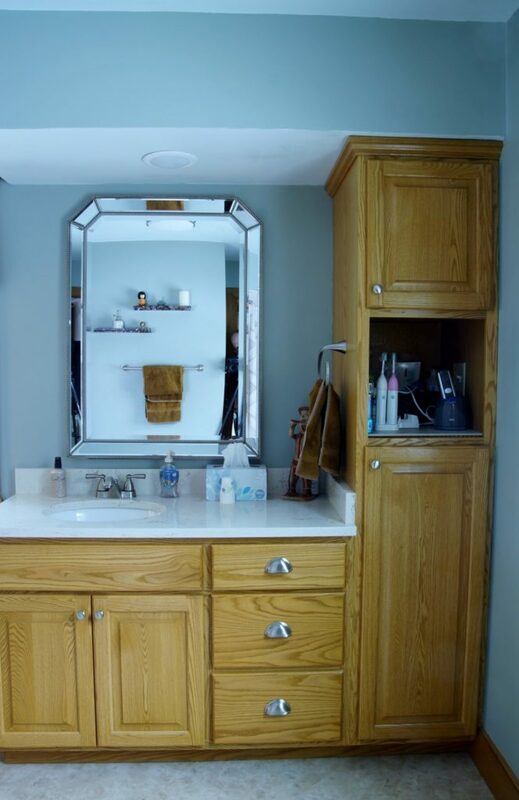 Bathroom Challenges: The bathroom was a space that hadn’t been refurbished in several decades and there was a lot of opportunity to make it a more serene room. Areas we needed to tackle in order for this to happen included the paint color, cabinetry, wall color, and flooring. was replaced with 12” x 18” tile installed in a brick pattern at a 45° angle. This approach both modernized and enlarged the space. The room took on a tranquil ambiance with the green sponge painted & wallpapered walls being replaced with a calming blue paint. "We already have the LeafGuard® Gutter System (which we love), but needed them removed temporarily while we had new soffits and facia installed by Lindus Construction. It was a two day project because we have a walkout rambler. They did an excellent job and the cleanup was fantastic. We look forward to our house "breathing" more efficiently!" - Vicki S.
"My experience with the Lindus Construction crew was that they were excellent, professional, and efficient. We worked with Danny who personally saw to it that the job was exactly what we wanted. He was very personable and listened to our needs. I will certainly recommend the company to others." - Richard D.